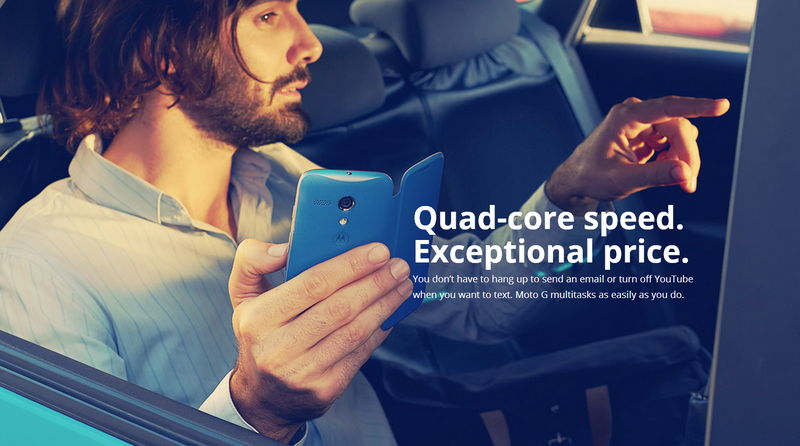 The words "no compromise" and "mid-range" would seem to be mutually exclusive, but Motorola would like you to think otherwise. The company announced the Moto G in a live event, promoting a cheaper and slightly lower-spec version of the flagship Moto X. This phone is Motorola's wide-ranging model, the first that's been introduced since the X, and it's intended to be cheap enough to be purchased without a contract. 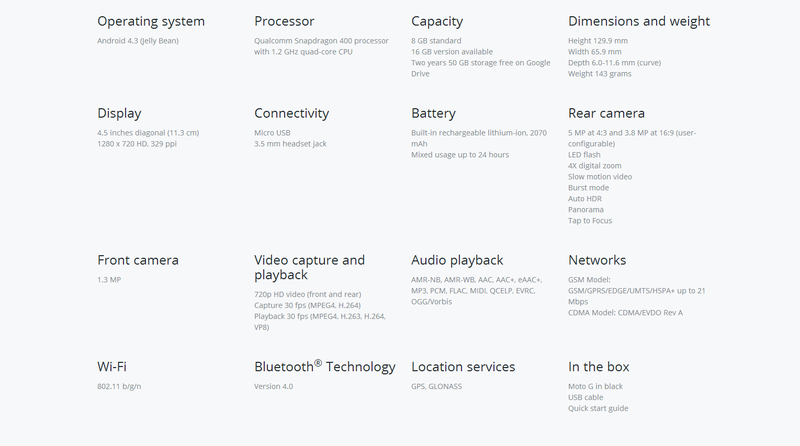 We could tell you all the specs and technical details, but the most important factor in the Moto G is the price. The Moto G starts at just $179 for the 8GB model and $199 for the 16GB model. 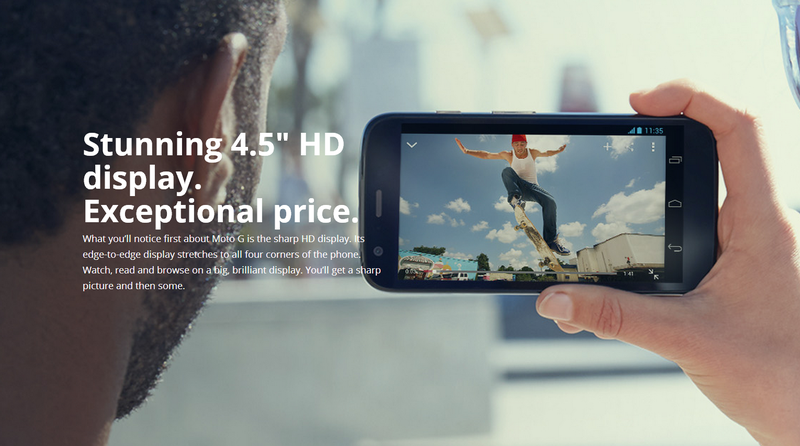 That's the unsubsidized, no-contract price, and the phone will be sold on Motorola's online store directly to consumers. That's an enviable price for any phone, but for a brand-new mid-range device, it's unbeatable - even the Nexus 4 started off at $349. The hardware is basically a smaller and less-powerful copy of the Moto X. The screen gets a small downgrade to 4.5", while maintaining the same 720p resolution. The body itself uses the same glossy front and curved back as the X, complete with stock Android on-screen navigation buttons. Underneath you get a 1.2Ghz Qualcomm Snapdragon 400 and 1GB of RAM. (Yeah, that's a little low.) Motorola is saying that the battery lasts "33% longer" than its competitors, though it's only 2070mAh. The Moto G includes an FM radio tuner (for markets where data is too expensive) some models will have dual SIM functionality, and there will be CDMA variants. Cameras are 5MP on the rear and 1.3MP on the front. When it comes to software, the Moto G will launch with Android 4.3 and some very light Motorola software on top, with an update to KitKat 4.4 scheduled for January 2014. Apparently the Moto G does not have the same touchless voice control or active notifications as the X or new DROIDs, but we're still trying to confirm this. The Moto G comes with 50GB of bonus Google Drive storage for two years, for a total of 65GB. Motorola is pushing the customization aspect of this phone, but not in the same way as on the Moto X. 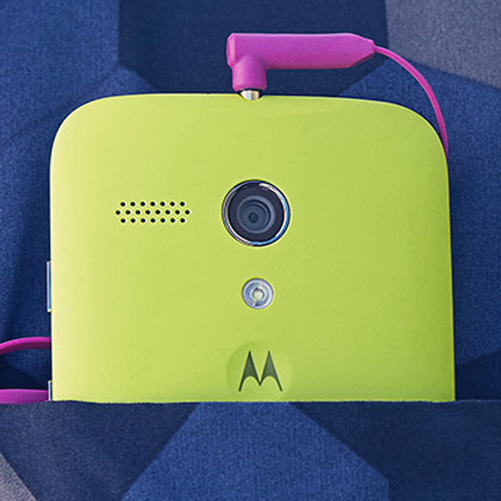 The Moto G has a removable rear panel that can be swapped out for plastic panels of different colors. (It looks like the phone has an integrated non-removable battery.) The company will also offer "tough" impact-absorbing backs and a flip cover a la the Galaxy S4, and color-matched accessories from SOL and others. The Moto G is launching today in Brazil and parts of Europe, with a wider release in Europe, Canada, Latin America, and some parts of Asia in "the next few weeks." The US version will be available starting in January. Motorola will be expanding availability to more than 30 countries in early 2014. Motorola has not announced its carrier partners for the US launch, but you can expect the on-contract price to be low, or even free, given that low starting price. 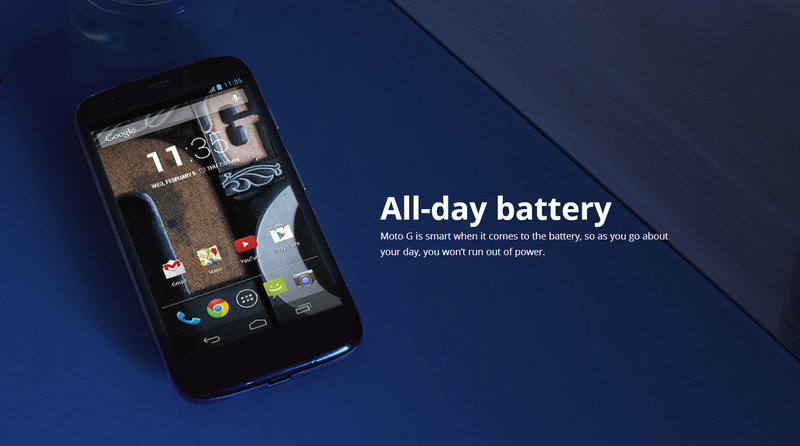 Update: Here's Motorola's first Moto G commercial.